In 1931, when he was tapped to equip Frankenstein’s tower laboratory with its own "powerful engine", Kenneth Strickfaden brought a unique set of skills to the job. Born in Montana in 1896, Kenneth Strickfaden’s early, adventurous career took him all over America working in amusement parks, and overseas serving in World War One. He raced cars and boats, put time in as an airplane mechanic, built and tuned Tesla coils and X-Ray machines, eventually ending up in Hollywood, in the late twenties, as a studio electrician. When called upon to assemble the lightning-powered machines that would blast Boris Karloff to robotic life, Strickfaden combined equal parts electrical science and sideshow pandemonium to create the ultimate Mad Scientist’s Laboratory. Early designs for Frankenstein proposed a neat, modern laboratory, but by the time the set was built, Strickfaden’s forbidding science fiction contraptions were installed in steampunk juxtaposition against the medieval stonework of Frankenstein’s mountaintop hideout. Strickfaden’s machines sparked and screeched as levers were pulled, blinding electric arcs dancing wildly in glass vials and streaming off copper spheres. Needles went off the dials as magnets hummed and corona disks whirled out of control. Frankenstein’s machines concussed and smoked from way too much voltage. You could almost smell the scorched metal and the waves of ozone. 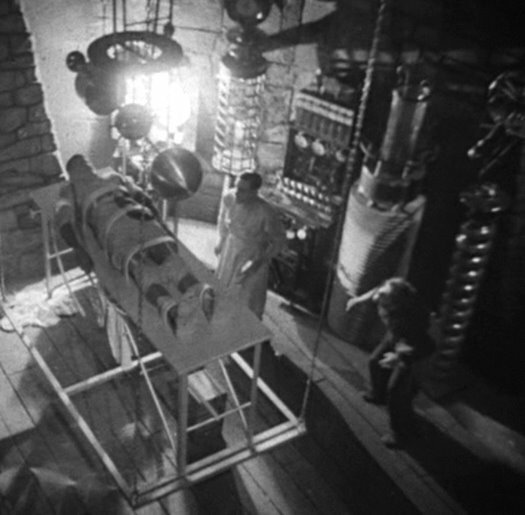 Frankenstein’s 1931 laboratory became the instant, permanent movie mad lab reference and Strickfaden would recombine and reuse his booming, spark-blasting machines not only in most Frankenstein films to come, but also in Flash Gordon serials and countless horror and science fiction films for decades to come. 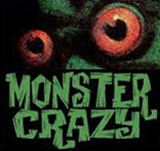 The original equipment was still being used in an episode of TV’s The Munsters in the mid-sixties, and hauled out of Strickfaden’s garage again for Mel Brooks’ Young Frankenstein in 1974. 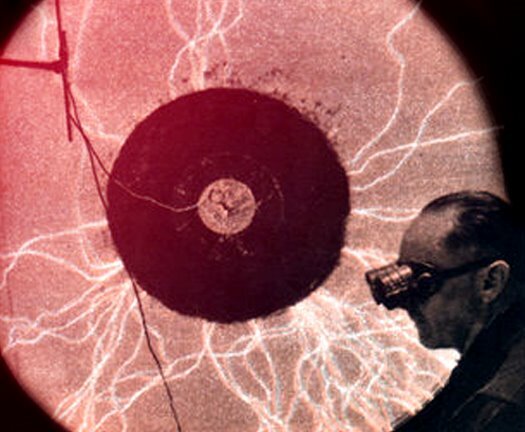 On a parallel track, Strickfaden lugged his gadgets all over North America as eye-popping teaching tools, lecturing in schools and auditoriums from 1933 until his death in 1984. The image at the top is from a 1949 article, High Voltage Magic, in Popular Mechanics Magazine, posted on the excellent and ever-fascinating Modern Mechanix blog. Click through to see the whole article and more pictures of Kenneth Strickfaden at work. 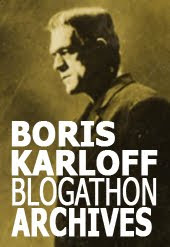 The article mentions that Strickfaden doubled for Boris Karloff, but it was not in a Frankenstein picture. Strickfaden stepped in for Boris for a hair-raising scene, holding a large sword in a streaming arc of lightning, in MGM’s The Mask of Fu-Manchu. The studio must have heaved a sigh of relief as it was a badly grounded Strickfaden, rather than their star, who was thrown clear across the set by the electrical blast. Strickfaden was shaken but, thankfully, not barbequed. Strickfaden’s biography, Frankenstein’s Electrician, by Harry Goldman, from McFarland. Also available through The Frankenstore. Photos from the Academy of Motion Pictures homage to Strickfaden. A selection of surviving gadgets from Strickfaden's movie laboratories. Excellent post on an often forgotten or ignored artist who had a huge influence. Really been enjoying your blog. I wandered in here a few weeks ago looking for Bernie Wrightson stuff. Keep it up!